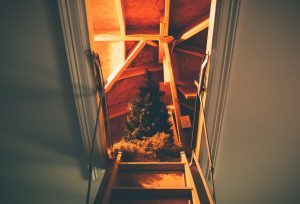 The house I grew up in had one of those attics that could only be accessed by pulling a string attached to a small door carved into the hallway ceiling which had a foldable and rather flimsy hinged wooden ladder attached. The space in the attic was not only unwieldy to get to, but it was one in which we could not stand fully upright and which had a floor formed by a mix of scattered plywood and exposed pink insulation. I remember the time I was watching TV in my parents’ bedroom and I saw my dad’s entire leg come through the ceiling of his clothes closet. He was putting holiday decorations away in the attic and mistakenly stepped into a space that had no floorboard. Whoops. As much of a pain in the neck as it was to navigate that darn attic, we never hesitated to throw things up there. Literally throw them. 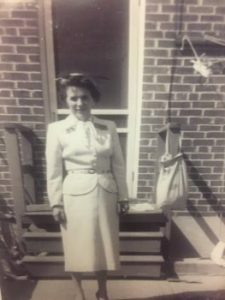 I can still envision my mom pulling the attic hatch halfway down and tossing trash bags of God-knows-what into the dark opening. With no garage, what were we to do? Saving and storing was a must. Holding onto things is part of an age-old legacy, right? When Marty and I bought our second house, we not only had a huge walk-in attic with easy access from the bedroom level, but we also had a three-car garage. Now we were talking. We would never run out of places to store our stuff – yay!! When we sold the house and made the move last April, my “yay!” transformed into a “WTH? !” Let’s just say we definitely did our part to preserve that age-old legacy in the 15 years that we resided there. We filled two commercial-grade dumpsters to prove it. 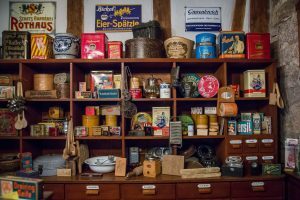 Why Do We REALly save and store? Most of us have a tendency to save things. 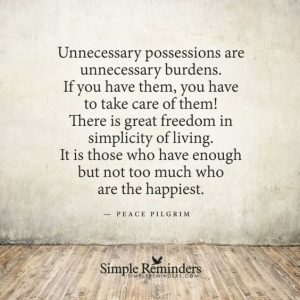 Our shared resistance to part with possessions is no doubt a result of more than one dynamic, not the least of which is society’s consistent message that more stuff equates to more success and more importance (even if the stuff is hidden on the shelves of our closets). Aside from the relentless push to amass a large volume of material wealth, we each grapple with our own unique brand of neurosis that plays into our attachments to certain objects. Whether it stems from anxiety, obsessive-compulsive thinking, a childhood filled with poverty and hunger, or an unconscious need to overcompensate for some perceived area of lack in our life, we each have a handful of individualized demons that perch themselves on that one shoulder and encourage us to forever hang on tightly to everything that is ours. I think we can all relate to at least one of the following reasons behind our collective struggle to let go of things. They have sentimental value: we attach things to memories, they remind us of people and experiences (we should try taking a picture of an item if we need more than a mental image of it in order to sleep at night). We feel guilty getting rid of them: we associate objects with loved ones and feel disloyal discarding them (we should sharpen our REAL perspective: are we REALly showing respect and gratitude by letting those things collect dust?). We attach previously treasured (a.k.a. old) dreams and hopes to them (we should REALly think about this: do these items accurately represent the REAL lives we are looking to build now, today?). We saw the Toy Story movies too many times (we should be REAListic about what happens to objects after we discard them. We can curb the guilt and worry by recycling and giving away as much of it as we can). Many people try to solve their most pressing issues and challenges from the same space that they were created in. Similarly, when it comes to setting intentions and goals, people attempt to add new dynamics and experiences to their existing situations. In almost all cases, the common result is a sense of frustration and a gradual loss of momentum to do the work that supports their desired outcomes. It is next to impossible to build a solid and sturdy structure onto a foundation that is rotting and weak in some areas. With a bit of re-organization and refinement, however, any foundation can be reinforced and renovated to support new designs and additions. We can clear the way to build our REAL lives. Clearing and purging combine to form the crucial first phase in any reinforcement and rebuilding process. Paving the way to intentionally construct our REAL lives is no exception. The acts of physically cleansing our living and working spaces and emptying them of no-longer-useful things serve as REAL-time training for the mental and emotional unblocking and releasing that awaits us a little further down the road. 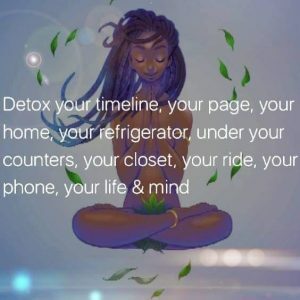 We will begin with cleaning our outer, tangible spaces in a literal way, which will prime us for the future scrubbing up of behaviors, beliefs, and inner environments that we will eventually get to in the later phases of REAL-life detox. This is transition training at its best, friends. True to the cornerstone approach that REAL living embodies, we will move forward at an easeful and manageable pace. We will fully embrace, yet not rush, the process of letting go. We kicked off our REAL-life space detox ritual this week, and I am eager to share my approach and my subsequent learnings with you! I encourage you to share your insights and revelations with me as well. It is a REALly beautiful thing to be traveling on this journey together, and trading our thoughts and ideas along the way will help us all to grow. Do I see this being useful and valuable to the REAL life I am now creating? Will it fit into and support my vision for the new and improved experiences I will manifest in my REAL life? Does it/will it make my life easier and simpler? Does it make me feel good, content, happy, peaceful? Will I REALly need or use this a year from now? REALly? A resounding yes? Great! Keep it, clean it, store it appropriately and in an organized way (or perhaps bring it out into the open again). A resounding no? Options: throw it in a trash bag, a recycle bin, a donation box, or the Goodwill pile. Make the choice within 10-15 seconds, and move on. Every Sunday morning, I read one section of a wonderful little book I bought for myself over Thanksgiving weekend. It is called Joy in Every Moment: Mindful Exercises for Waking to the Wonders of Ordinary Life, by Tzivia Gover. Right on time (of course), the section that was cued up for me to devour this past Sunday was all about creating and experiencing joy in one’s home. How fortuitous! The universe knows what we are up to (no surprise). Gover encourages us to think of each room in our apartments, condos, or houses as representing our intention to feel truly at home in our hearts. Through that lens, we can mindfully refine and revise our spaces understanding that each of them is sacred ground and should contain only items and ambiance that inspire inner peace and joy. 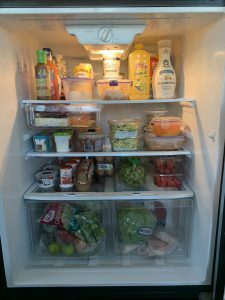 My refrigerator represents my desire to nourish my body in new ways and with more intention. 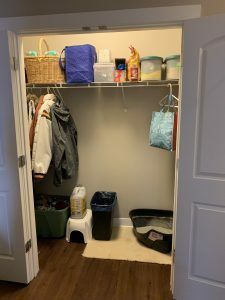 My closets and cupboards demonstrate my commitment to securing only items that make my moments and days simpler and healthier, and allow me to function with increased ease and efficiency (efficiency being the gateway to a world in which I have additional time to spend in REAL ways). 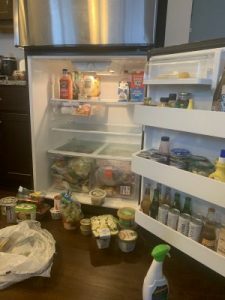 As I dredged through my fridge, cabinets, closets, and drawers, I mentally poured every item I came across through the filters of the above criteria. I mindfully contemplated how I could change up each space to reflect peace, joy, and inspiration. 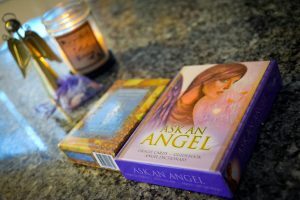 I knew going into this month-long ritual that the progressive cleansing and clearing would leave me feeling REALly inspired and organized, but I could not have predicted the additional positive side effects that sprung up and pleasantly surprised me throughout the process. Clarity: When we feel clear, we are able to see ourselves and our lives with greater lucidity. We understand what is occurring for us and why, and we know what action to take to best honor our personal truth. 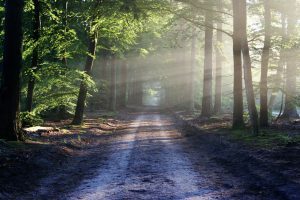 Wiping away the fog and mess in our lives – from cleaning and clearing our homes, to cutting negative ties, to clearing away and replacing negative self-talk – allows us to return to our center and see our lives with full transparency. 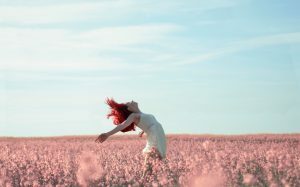 Freedom: It is liberating and freeing to clear out and let go of the old and no longer useful junk. 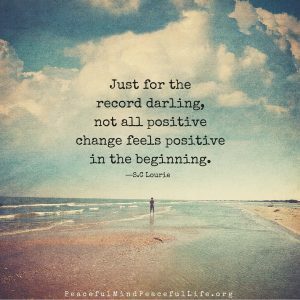 Starting with a clean slate offers a sense of both release and hope. Productivity: Typically, our knee-jerk M.O. involves busying and distracting ourselves during time we would otherwise label as “spare.” The act of deliberate clearing and cleansing our physical spaces can help us meet ourselves in the middle. We can still do something that will keep us busy and can be categorized as productive, which satisfies our rational self. At the same time, we can approach the task in a mindful way, also using it as a chance for solitude, silence, and a sort of working meditation (which fuels our intuitive self). 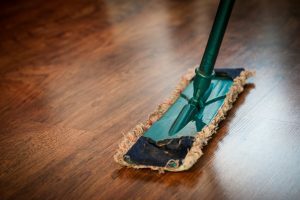 Meditation & Mindfulness: The very act of cleaning and clearing can in itself turn into a subtle meditative exercise when done in solitude and relative silence. 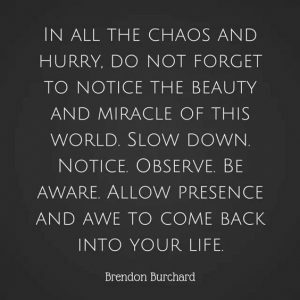 This approach can offer a chance for each of us to be with ourselves in a new way and unblock the invisible wall of busyness that keeps potentially profound insights from emerging. 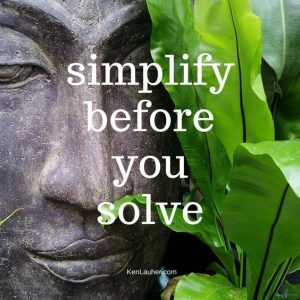 Simplification– not only do we remove unnecessary and no-longer-useful items from our worlds through this ritual, but we organize what remains in a way that can create more ease in our days moving forward. As a result of cleansing and clearing, we have less to manage. Even better, what we do keep can be intentionally stored in a way that makes things easily accessible and simpler to manipulate, ultimately minimizing those tiny inconveniences and small – yet aggravating – complications that can sour our moments. Charity: Our trash is likely another man’s treasure. 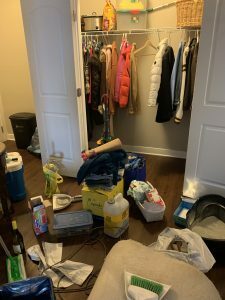 Clearing and de-cluttering our spaces generate bags and boxes of items that may no longer be useful to us but might be needed and desired by someone else. We can shed our excess and give it to others who do not have enough. One week, six trash bags, three recycling bags, four donation bags, and one Goodwill box later, I stand in a clearer space with a lighter feeling and a renewed perspective. I have merely scratched the surface of my REAL space detox ritual, and I already sense the channels clearing. I made the choice to cleanse, purge, and refine my first handful of targeted spaces in relative silence. Music was my only companion. 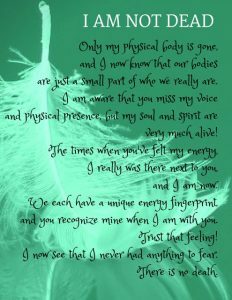 Though there was no physical conversation, the areas I moved through did speak to me in very profound ways. Through the forgotten items that I rediscovered, memories that were roused, and revelations that surfaced as I reflectively flowed through the process, my spaces communicated with me. There were no words exchanged, but in the quiet and solitude I detected their sentiments with full clarity and awareness. Cherish your friendships. Remember your ancestors. Roll with the tide. Be the light. Go on more picnics. Buy only clothes that express the REAL you. Nourish your body. Uncomplicate your life. Slow down. Be grateful. Let go. As far as I am concerned, friends, my fridge and closets just spilled the REAL tea. Join me next week to continue our REAL space detox ritual, and take another giant step closer to your REAL and authentic life. Get REAL charged up about clearing your space and making room for your REAL authentic life in 2019. Check out more REAL resources in the library, and subscribe now to receive additional insights, inspirations, and videos! Shopping in a Mexican Walmart is quite an experience. Aye yai yai. I will sum it up in one word: SLOW. Or should I say, SLOOOOOOOOOOOOOOOOOOOW. When we arrived in Playa del Carmen for an early December get-away with friends, our mission was clear: check in, drop bags, speed-walk to the Walmart for food and libations, and get back to the condo as quickly as possible so that we could start working on our tans and get the blender going. This is our standard first-day-of-vacay protocol, so we were mentally prepared….at least, we thought we were. Let me just tell you that I have been to a lot of markets in a lot of places, and I have never seen a mass of food-shoppers move so slow in my entire life. People perused as if they were viewing an exhibit in a museum, floor workers stocked shelves and walked the aisles in almost backwards motion, and cashiers seemed to be holding a secret competition to see who could scan items and count change the slowest. We conquered and divided in order to speed up the process, and I was placed on snack detail. To the overhead sounds of foreign Christmas carols, I frantically raced up and down aisles and searched for the items on the list. I huffed and sighed as I impatiently whirled my cart around all of the aimless wanderers and searched for the chips and salsa. Where in the hell was the Pace Picante??!!! Guess what? Mexican people don’t buy pre-made salsa, amigos. They make their own. Duh! It took me about 15 minutes to solve that frustrating mystery. My irritation was quickly diminished when I discovered that a case of Corona was $9.00 (NICE!!!). They didn’t know, nor did they care. They were probably thinking that we were just another bunch of panicky American tourists rushing around so that we could hurry up and relax. Hurry up and relax…yup, admittedly, that’s about right. As Marty would also say, “I resemble that comment.” I resemble it too. We. All. Move. Too. Fast. We don’t even REALize how quickly we are zooming through our moments and days until we find ourselves smack in the middle of a Mexican Walmart, stuck in line, and forced to stand uncomfortably still and REALly think about. We move quickly, and we expect things to happen quickly. We tend to have zero patience for anything or anyone that falls short of immediate responsiveness. When we make the decision to do something, we swiftly spring into action, and we anticipate prompt (if not instantaneous) results. ASAP is our unfortunate mantra here in the United States. Depending on which part of the country one resides in, this exists in varying degrees. At the end of the day, however, most Americans move, think, and talk at an extremely hurried pace. 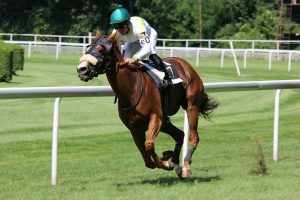 While acting fast can absolutely be a positive approach in some situations, the unconscious and deep-seeded effects of a habitual rush-mode lifestyle tend to sabotage our best intentions. Our learned and routine sense of urgency and immediacy undermines our relationships, our physical health, and our general wellbeing. It disrupts the path to our goals and our overall progress, making it challenging to create REAL and lasting change in our worlds. It’s just not a productive way. Not good at all. We have to rein it in if we want to win the race. We are energized in a unique way during the months of December and January. The turn of the 12-month cycle is symbolic and inspiring, and most people experience it as an ideal time for new beginnings. 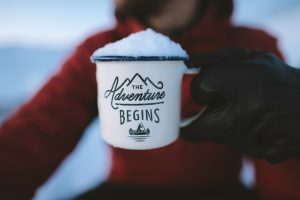 True to our hasty and impulsive nature, we typically waste no time taking advantage of the super-charged motivation that we have when we are standing on the edge of a new year. 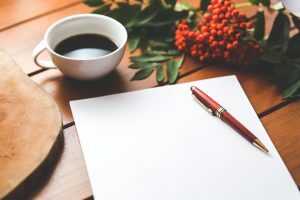 We begin to mentally draft our resolutions and goals long before the presents are wrapped, and we start jotting them down and talking about them before the holiday ham is even in the oven. When that first week of January hits, we come out of the gate like thoroughbreds in a Triple Crown horse race, ready to plow through our intention list and transform our worlds. Statistics indicate that about 10% of us will finish the race. Yikes. It takes more than speed and lists, friends. The REAL work starts long before the horses get to the starting gate. Why do so many of us struggle with maintaining the resolve around our resolutions? Simple: We pull the trigger on them way too fast! 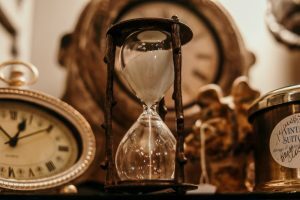 We are hyper-focused on rapidly diving into our newly-envisioned lives and goals ASAP, and it doesn’t occur to us that pressing pause and taking a bit of upfront housekeeping and stage-setting time might be useful. Our impatient brains shout, “I ain’t got no time for that!” and our conditioned minds urge us to launch into immediate action. Per the usual, we rush things. We jump the gun. I don’t have to tell you what typically happens as a result of that…the data speaks for itself. We have to take out the trash before we can bring home the treasure. What most people miss is that before we can successfully bring new and renewed elements into our experience, we must first make room for them. We need to pre-plan and proactively carve out space for our new intentions to cultivate and operate within. We need to sweep our chimneys before we strike the matches and ignite the fire of REAL change. Life is an experiment. Life is a dance. Life is an adventure. Scientists ensure that their labs are free of germs and toxic variables before they test new methods and procedures. Performers ensure that their stages are clear of obstruction before they start to twirl around and move to new steps and beats. Explorers analyze their maps to plan for potential obstacles and hindrances before they set off on excursions to new territories. We have to clear a path and remove the debris and excess out of our way before we can pull new things in and add them to our existing landscape. There must be a purging of sorts. All solid renovation and construction efforts start with a cleansing and a clearing out of the space to be altered. There is a lot to be said for a little time and space. 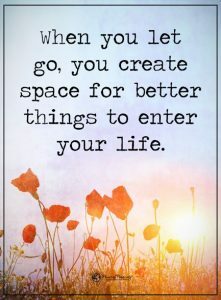 There is only space for so much in our lives, and this is true regardless of whether it’s mental, physical, or emotional collateral we are storing. When we overcrowd that space by trying to heap new stuff onto old stuff, it usually doesn’t go well. The pile will, at some point, become imbalanced and topple over. So… we have this finite amount of space to work with, space to hold our mind, body, and spirit inventory. We now intend to refine and refurbish that space by trying some new activities, changing our thought patterns up a bit, tweaking a handful of our behaviors, and making some shifts in our routines. What will we remove from our daily dockets in order to make room for those new activities? What perceptions and internal narratives will we work to wipe from our minds in order to make space for the newer healthier thoughts? What behaviors will we be looking to rid from our repertoires so that we can make room for the new inventory? What will we scratch from our schedules so that we have time to account for those shifts to our daily regimen? The cornerstone component of REAL living is simplification. The aim is to refine and innovate our daily experiences so that we are less taxed and more at ease. 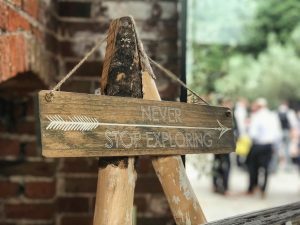 It is tempting to shortcut the intention-setting process by just adding the new to the existing and hoping for the best, but that approach will only leave us feeling more burdened. The alternative? We can slow down and take some time to survey and analyze our space. We can identify what needs to be discarded, cleansed, and/or moved around in order to make way for the exciting enhancements and additions that we will use our REAL power and energy to create. We will set intentions with clarity and a clean slate. We will detox before we develop. Over the next month, I invite you to join me in an across-the-board REAL living detox. This will not be a competitive game or a difficult challenge, but rather a soothing and healing ritual. Together, we will literally clean and clear out the spaces in which we live and breathe. In doing so, we will make for a more organized and polished start to the year, and more importantly we will set the stage for the mental and emotional cleansing that will inherently become part of the process as we move closer to operationalizing our 2019 intentions and goals. Over the next four weeks, we will clear the channels and scrub up all types of spaces and places: where we eat, where we sleep, where we lounge, where we work, where we travel, and where we digitally live. Our Mission: De-clutter, cleanse, clear, tidy, and detox all spaces in our lives. We will take this at the gradual and manageable pace that REAL living calls for, and we will allow ourselves about one month to cleanse and clear. Each week, for four consecutive weeks, I will pass along applicable info and tips and share my personal progress and insights with you. 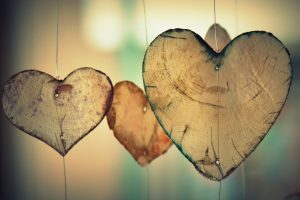 We will complete our detox and clearing ritual during the week of Valentine’s Day, a fitting time to honor and applaud the fact that we love ourselves enough to take the time for this invaluable and healing exercise. The best part: we will culminate and celebrate our efforts together with my very first REAL Tea YouTube video! Clean your gear and grab your bag, we are headed someplace new! Creating, renewing, and manifesting change are inside jobs. Internal work is key. At the same time, though, we need to recognize and acknowledge that our outside worlds, the environments we move around in and the spaces we occupy, are a direct reflection of our inner landscape. 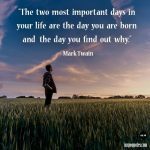 There is a very REAL connection between these two sides of our experience, and we have the REAL power to use that relationship to our advantage when it comes to promoting change and newness within our moments and days. 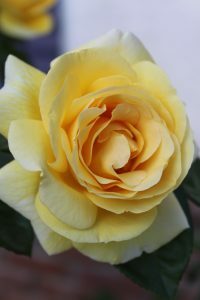 Through the act of consciously detoxifying and cleansing our outer spaces, we are giving advance notice to the universe that we intend for our inner worlds to mirror the crystal clear and clutter-free backdrop we are carefully preparing. When the work of cleansing is complete, we will be standing together with wide open spaces and hearts, ready to inspire REAL change and build our REAL lives upon the foundation of our REAL intentions. I leave you with an excerpt from my newest book purchase, Journey to the Heart by Melody Beattie. It is no coincidence that these words crossed my path this week. Cheers to the transformation and joy that await us in the new places we will discover together as we explore the wonders of REAL living. You are opening up more and more. You are becoming clearer each day. Embrace the changes taking place. They are good. They will last. They will take you and your life to someplace new, someplace you can’t fully imagine now because it is so different than where you have been. All will be changed. Your love, your life, your friends, your work. Your quiet moments and your times of sharing. Your play time, your rest time. Your attitude will change. Your ability to fully enjoy and joyfully experience your life will change. Things that used to bother you, hold you down, hold you back will roll off easily. 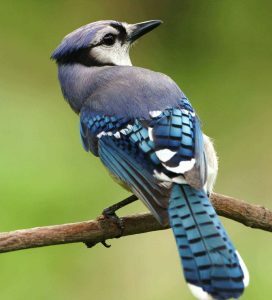 Problems that used to plague and pester you, making you feel weighted down, will be lifted easily. You will know and trust that the answers you need will come to you. Your powers will increase. You will find yourself doing, knowing, and feeling things that you thought only certain others could do. You will find yourself gliding through life in a way that brings you joy, and touches and heals others. You will laugh a lot. And yes, you will cry a lot too, because an open heart feels all it needs to feel. But you will not think twice about your emotions. You will feel them with the purity of a child and the wisdom of a sage. You will see, touch, taste, and feel life’s magic in a way you never imagined. You will love, and you will be loved. And you will learn that it is all the same. You are open now, more open than you’ve ever been. Trust the process and trust your heart. The journey is not in vain. Its purpose is to lead you to love. Get REAL inspired about cleansing and clearing your space and making room for your new REAL life in 2019. Check out more REAL resources in the library! I have had the pleasure of spending the better part of these last 2018 mornings nestled on my couch, listening to soft jazz, and reflecting on the happenings and blessings of recent days. 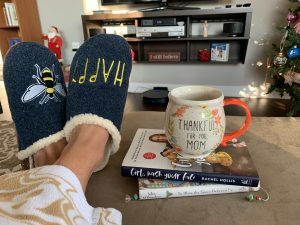 With my new cozy, Be Happy slippers warming my feet, piping hot coffee filling my new Thankful for You Mom mug, and my new fresh balsam candle emitting a crisp winter forest scent, I have savored the start-of-day stillness and allowed my thoughts to gently wonder. The common thread that has weaved together the images, memories, and sentiments swirling around my head and heart have centered around one word: change. It’s everywhere. Change has been a quite pronounced headliner theme in my life over the last weeks and months, and I can tell from recent conversations I have had and heard that I am not alone. In December, I talked with strangers about changes in holiday traditions and celebratory routines. I spoke with relatives about changes in their careers and residences. I chatted with friends about changes with our children’s pursuits and our parents’ health. Within my own four walls, we discussed everything from making nutritional changes, to noticing changes in friendships, to experiencing changes in our ideas about life direction and goals. Personal, community, and even global shifts abound. I have the sense that it is just the beginning. Why are we so afraid of change? Change can be…scary. Unfortunately, we have all been programmed to fear it at some level. It isn’t always a negative thing. In fact, change can be a very good thing. Still, even the most positive changes can sometimes feel like a burden when they first come to pass. I knew that when my daughter chose to go 1,000 miles away for college that it would be a fantastic experience and much-needed change of pace for her, but it still made me sad to think that our family unit would never quite operate in the same way again. Change comes with a level of uncertainty, which is unsettling. It can be less of a problem when we are in charge of implementing it; but whether it happens with or without our intention, it all tends to come with new and unexplored territory (which, in turn, tends to spark anxiety). There is a sense of safety and security that comes with knowing what to expect, and change throws a wrench into that. We don’t always handle things gracefully when newness of any kind shakes up our carefully packaged lives. People prefer predictability. In fact, they prefer it so much that they often resist change and continue to tolerate unhealthy situations, people, and/or circumstances longer than they should, for no other reason than that their fear of the unknown trumps their motivation to leave the comfortable bubble they are accustomed to floating around in. We’ve all been there. There is one thing we can count on never changing, and that is that change will always keep coming. Why do we allow ourselves to fear that which we cannot avoid? Wouldn’t it be easier and simpler to welcome it with open arms? Deviations from our normal routines make all of us uncomfortable, and the REAL truth is that each of us makes the choice to feel that way. Fear of change, just like fear of anything else, is a personal decision. Other people might be responsible for how we thought and felt when we were little; but we are all grown up now (at least in theory 😊), and the way we think and feel about life today is all on us. The amazing news is that because we have decided to live for REAL, we now recognize that we have the power to change up anything that we wish to. We can transform the way we think and feel about anything by redefining and recreating our thoughts and perceptions around it. Our view of, and approach to, the role that change plays in our worlds is no exception. With awareness and intent, we can refocus our energy and harness our power to experience change in an entirely new way. We don’t have to be afraid of change any longer. What a relief. For me, living for REAL means feeling content and at peace most of the time, regardless of what is happening in my world. It is about setting up the logistics of my daily life so that I have a better shot at feeling good and happy in the majority of my moments and days. This involves proactively clearing my life of the things that don’t bring me joy and pulling in more of the things that do. The snags hit when I run into those dynamics that I can’t control…like change. I know I can’t stop it from happening or remove it from my life, so my only option is to overhaul my whole take on the subject. 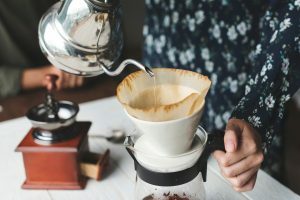 If I pour it through a new filter, change may taste sweeter. If I can train my mind to see it in a different and REAL light, as something positive (and maybe even fun), I have a better than even chance of turning it into something that actually adds to my peace and contentment (or at the very least, doesn’t rob me of it). Lately, I have been working on rewiring my brain by using alternative words to describe change. My top two favorites are evolution and revolution. It just feels better, more hopeful and encouraging, when I say that something is evolving or revolving. Both words give the sense that something is in process and holds promising results, rather than implying that something is abruptly beginning or ending. It is more comforting and calming to see life through a lens of continuously moving cycles and processes, as opposed to a chain of random stops and starts. From this perspective, there REALly are no endings to mourn. Evolution promotes the idea that something is being improved upon and expanded. Revolution inspires a state of excitement and a sense of rebellion against old, worn-out circumstances. I feel assured and inspired just typing the words! Simply by shifting the descriptors I use to tell my story about changes occurring in my life, I change up the emotions and thoughts that I attach to them. I am consciously removing the trepidation and worry and replacing those with excitement and anticipation. Words are a REALly powerful tool. Additional synonyms that work include transformation, transition, refinement, development, and innovation. Try switching up your vocabulary and using one of these terms the next time you are talking about a change you are experiencing. Notice the difference in how you feel when you stick a more positive and appealing label on it. I went to see Mary Poppins Returns this week, and it was fantastic! In one of the scenes, a quirky cousin of Mary’s is very upset and confused, because her whole world has physically and literally turned upside down. 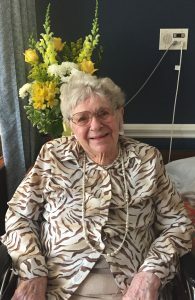 Mary suggests that her cousin simply adjust her perspective by standing on her head; and, of course, from her new upside-down vantage point, she sees things more clearly and becomes happy and calm again. Voila! Change can sometimes make us feel like our worlds have been turned upside-down. 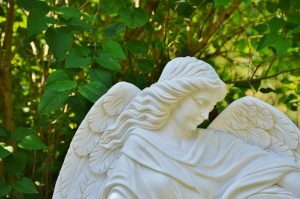 Perhaps if we took Mary’s advice and aligned our perspective accordingly, change would feel less like upheaval and become easier to navigate. Am I implying that you should attempt a headstand the next time you are faced with unsettling change? Not exactly (although in yoga, those types of positions are very cleansing and calming!). What I am suggesting is that we practice the art of rolling with it. What if we relinquished control and simply rolled with the punches of change? 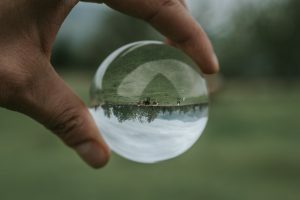 What if we restructured our perception of change and approached it from a counter-intuitive, upside-down vantage point? What if we just decided to stand on our figurative heads the next time something in our lives seemed to flip upside-down? Might we see things differently and feel less anxious as a result? This past April, my family transitioned from a spacious single family home into a small apartment. While the downsizing was deliberate, we have each navigated several resulting changes tied to this dramatic shift in lifestyle (some we anticipated, some we didn’t). One I did not predict was the impact that the change in residence would have on our Christmas routine. 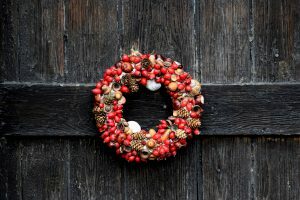 The holidays in my old house included wall to wall decorations, four Christmas trees, stockings hung from a mantle adorned with my favorite seasonal décor, a front porch covered in lights, a basement dressed up in Ravens’ purple ornaments with a theatre area perfect for Christmas movie watching, and multiple parties hosting family and friends. We did all of that for 15 years, and it was wonderful. Good times, great memories. When we started decorating and preparing for the holidays in the new apartment, it was initially a little disconcerting. There was no way I could fit all of my decorations in the new space, and I was forced to transition from eight bins to two (a travesty!). I had no mantle to beautify or to hang my daughters’ stockings from. There was no front porch to light up. There was no basement to decorate, no theatre-grade projection screen to view our favorite holiday classics on. There was certainly no room to host big celebrations (at least none with more than 6-8 people!). In early December, we all felt like our holiday traditions had been turned upside-down. About a week before Christmas, I decided to stand on my head to gain some perspective on the whole thing. You know what I saw from down there? I noticed an apartment filled with only my most sacred and prized Christmas decorations and memoirs. 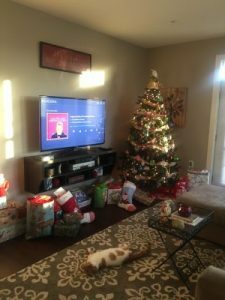 I saw a living area simply and beautifully adorned with one tree, which was still topped with our Santa angel and which we still decorated together while the movie A Christmas Story played in the background (as is tradition). 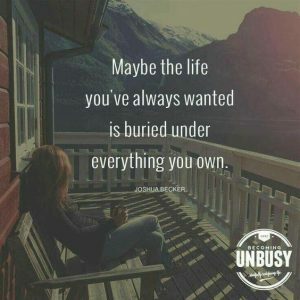 I saw all of the precious time that we gifted ourselves by moving into a smaller more manageable space, time that we used to spend decorating and maintaining a large house, time that we instead now spent enjoying more quality time as a family, time that we now had to restore and just be. I saw my three favorite people squeezed together with me on one couch, eating popcorn, and laughing out loud as we watched the Chinese waiters attempt to sing Jingle Bells to Ralphie and his family. “Standing on my head” and altering my perspective made me REALize that our Christmas traditions are simply evolving, and that we are transitioning into a new way of celebrating the season. It is different, but it is OK. We are innovating. We are transforming. We are growing. As Ralphie says towards the end of that movie, all was right with the world. Indeed, it is right. We can alter our perspective and experience of change by adjusting the language we speak and the filter we pour it through, but we must also redraft the script we read from when we are describing it to ourselves and to others. How we communicate and what stories we tell determine most of what we experience in life. What script do you attach with change? Is it one that includes the element of fear? Zig Ziglar says that FEAR has 2 meanings: Forget Everything And Run, or Face Everything And Rise. Do you want your story to be about running, or about rising? Will you decide to put up a fight? Will you opt to take flight? Or will you make the bold decision to try something ground-breaking like going with the flow? The choice is yours. I know from experience that fighting and fleeing take up an awful lot of energy (and are rarely effective). Flowing sounds much less complicated…calmer…easier. I choose flow. There is a good reason this is happening, even if I don’t yet know what that is. 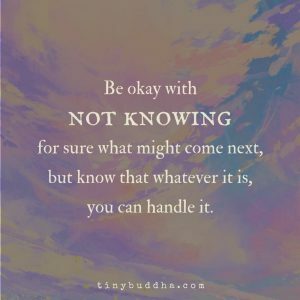 It is OK not to know. I can trust the process of life. I give up the resistance. Resistance only causes friction in the universe and knocks my vibration out of whack… not worth my energy. This is not good or bad, it is just…different. Change is an introduction to an adventure and new opportunity for growth. Life would be dull without change. Movement of any kind is a good thing, stagnation is not healthy. If I focus too much on what has been, I won’t be able to see where I am going. What will your new script sound like? Living for REAL centers around the art of embracing and inspiring REAL change. Change is not usually something we delight in or applaud, but perhaps it should be. Change blows regularity and predictability to bits, but maybe that is exactly what we need. Could it be that now is a good time to rip up our routines and willingly plunge into new and unchartered waters. Isn’t that what REAL living is all about? Change happens. People grow up, people grow old, people move, people switch jobs, people retire, people are born, people die, people’s personalities evolve, people modify their preferences and feelings over time, people change their minds. The list goes on and on. That’s life. Would we REALly want it any other way? Would we want a world with no variety, no movement, no dimension? No. We are all standing on the cusp of a new year. We are looking back over our shoulders and remembering all that has evolved over the last twelve months. We are shifting our gaze straight ahead and anticipating all that will come our way in the next twelve. We are standing in this unique place and time, knowing that change is on the horizon and sure to show up. We don’t know what form it will take or when exactly it will knock on our door, but we know it is inevitable that we will meet up with it. We are facing change right now, in this very moment. Let us greet change with a warm hug and usher it through our thresholds with love and acceptance. Let us invite it in like a good friend and allow it to transform and stretch us in new ways. Let us flow with the natural current of life and embrace its changing tides. It has been a wonderful year, and a wonderful decade, and a wonderful century, and millennium, and beyond…but you have seen nothing like what is before you. You cannot go back from who you now are. You can innovate, refine, develop, transition, transform, and evolve. You can create your own REAL revolution and decide to live for REAL in this moment. You can change things up and create a REAL life now. Get REAL inspired about going with the flow of change and living for REAL in 2019. Check out more REAL resources in the library! Peace on Earth, and goodwill to men. We often hear this hopeful sentiment during the holiday season. This feel-good phrase acts as a blessing of sorts, a wish for the universe to experience calm, joy, and unity. It expresses a desirable and enticing concept, of course; yet it is an idea that can be difficult to envision as a REAL possibility. Does REAL peace exist? Can REAL peace be created? Most people contemplate these questions at various points in their lives. Many ponder them on a daily basis, especially now. It is difficult to escape these kinds of doubting wonders when we operate in a world that constantly bombards us with evidence of violence, anger, and general turmoil. You can shield yourself from some of that by unplugging more and significantly limiting your media intake (an approach I use and highly recommend); but unless you live as an authentic hermit, it is hard to ignore and avoid completely. Being entirely cut off from information and people doesn’t align with fostering a balanced life of REAL wellness anyway. You require a minimal amount of data in order to survive and function, and pure isolation is simply not healthy. So where does that leave you in the quest for REAL calm, joy, and unity? How can you find REAL peace and REAL rest in a society which reflects a seemingly steady state of unrest? Where on Earth can you look for peace? I recently came across an intriguing Happinez magazine article (issue14) about Arun Gandhi, the grandson of Indian spiritual leader and politician, Mahatma Gandhi (1869-1948). It talked about the life lessons Arun learned from his grandfather, his own views on ways to achieve peace in today’s world, and his new book, The Gift of Anger, which he wrote as a way to share his grandfather’s legacy and teachings. In other words, friend, you have the REAL power to make a difference from where you now sit. The one and only caveat: you don’t have the responsibility to do all of the saving of all of the world by yourself (admit it, there are plenty of you reading this who are figuratively killing yourselves trying to do just that). You only have two hands. You can’t (and don’t have to) do it all, and neither can any individual leader, country, or institution. What you can do, however, is take ownership of your personal piece of the world and make it your mission to save that. It is all about taking responsibility for generating peace in your life by rocking your own REAL stuff within your own space. Arun’s overall message stumbles upon a cornerstone concept of REAL living. You were born with the power to create whatever reality you choose for yourself (and for your world). If your vision for a REAL life includes an environment of peace, it is up to you to make it happen. The REAL tea is that the creation of anything REAL, peace included, begins and buds at a personal level. As with pretty much everything at play in the universe, REAL movement – on any front – starts (and ends) with you. Profound shifts of any kind occur from the inside out, not from the outside in. You need not look to world leaders and influential moguls to cultivate and support REAL peace on the globe, you need only walk into the closest bathroom and look at the person in the mirror. I am pretty sure that leaders and moguls use the bathroom too. . . imagine the possibilities if they all championed peace by beginning with the man in the mirror? Yes, you should do your part to stay educated to ensure that you are offering support to peace-minded and forward-thinking heads of state and industry trend-setters. At the end of the day, however, you only have REAL control over what you do to inspire a REAL shift for the better. If you don’t think you have the power to instigate bigtime change from the little bubble you are standing in, you are mistaken. That is your fear-based, skeptical mind talking. Don’t let your ego brain fool you into thinking that this is a next-to-impossible or monumental undertaking. 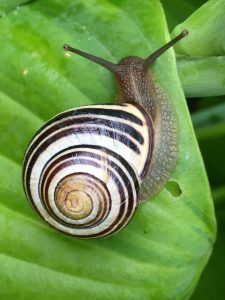 Allow your wise intuition to guide you into taking small palatable steps that will ripple out and create tidal waves of crazy good transformation. You can promote peace with a piecemeal approach. Creating a REAL life is done in simple and bite-sized chunks, and at a moderate and manageable pace. The same approach applies to impacting the world in positive ways and facilitating REAL change (i.e., inspiring REAL peace!). This does not have to be an overwhelming or complicated task, friends. 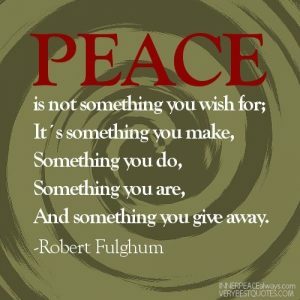 What does peace mean for you? Define it. Deep in your heart, what does peace look like? How would you describe peace of mind? There are no right or wrong answers. Responses will vary greatly, and they should. REAL peace will mean something different to you than it does to me. Many definitions of peace have to do with the condition of non-war, treaties and agreements, and freedom from civil commotion and violence. Others identify peace as freedom of mind from anxiety and distraction, a state of tranquility and serenity, or the experience of silence and stillness. One or more of these may resonate, or you might have a completely different concept of what REAL peace is. Feel free to use these more common interpretations as your foundation and build your own customized description of what REAL peace is. A bit of reflective quiet time will be required for this exercise (but hey, you can get that time in the car or in the shower . . . none of this has to be a big production). Which types of situations make you calm inside? Which make you feel less stressed? Which cause you to experience less anxiety? What other emotions do you associate with peace? What types of situations inspire those peaceful emotions within you? When was the last time you felt truly at peace and/or experienced those other similar emotions? What were the circumstances surrounding those times? 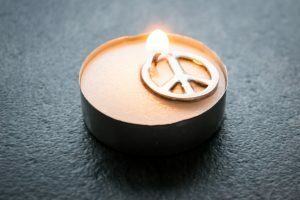 The answers to these questions will help you draft your unique definition of REAL peace. Word to the wise: the definition you come up with will be a working one, and you can fully expect it to change form over time. You will consistently evolve, and so too will your characterization of things like peace. Plan to revisit, reassess, and revise yours periodically. How can you bake more peace into your moments and days? Do it. 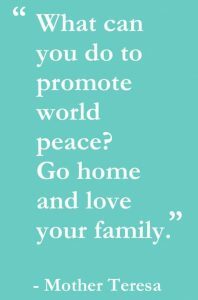 What are the situations that promote peace for you? What are the situations that take away your peace? Who are the people who promote peace within you? Who are the people who drain you of peace? 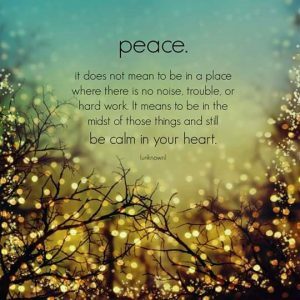 What are the places that inspire peace within you? What are the places that rob you of peace? What are the activities and event types that generate peace for you? 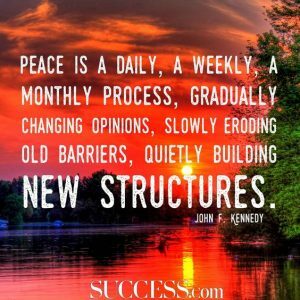 What are the activities and event types that steal peace from you? What are the topics that infuse peace into your conversations? What are the topics that sabotage communication for you and detract the peace from otherwise productive discussions? Step 1: Write your thoughts down as you run through this REAL peace inventory. Leave some space between each entry. Step 2: Go back through each category and add at least one starter action you can take to add more of what promotes peace and to alleviate more of what does not bring peace to you. Remember, this is a process you will tackle in small and simple steps. Begin by implementing gradual adjustments that can be inserted into your daily existence with relative ease. Example: If there is someone in your life whom you pinpoint as a peace-drainer, don’t pressure yourself by thinking you must completely cut them off immediately (which isn’t always logistically possible). Rather, consider subtly limiting your interaction time with him/her, and/or changing up the setting around those interactions (ensure that necessary together time is in a peace-generating environment, or that it includes other peace-invoking people (i.e., proactively install buffers!!)). Smooth your path to peace with healthy doses of goodwill. Performing an act of goodwill is one of the quickest ways you can inspire peace. Showing kindness and love to someone makes you feel good, it makes the receiver feel good, and it infuses a massive amount of good energy into the universe. It is a win-win-win. A 3-dimensional victory. A trifecta for REAL peace. Goodwill is all about practicing charity, and – as you might have heard – charity begins at home. Your first home is yourself. Your second home is with your family and friends. Your third home is within your community. These three homes create that personal piece of the world that I talked about taking ownership of and creating peace within. These are the spaces in which you can begin to whip up steady doses of peace, joy, and unity. How do you demonstrate good will to your friends and family? How do you offer good will to your community? If your self-assessment has you coming up short on one front or another, think of at least one new way you can start to promote peace in that particular home (and add these ideas and goals to your notes from the previous reflective exercises). Keep your approach simple and manageable. Grand gestures are nice, but smaller ones are just as meaningful. Set aside a weekly time to enjoy one of your favorite peaceful activities, make it your mission to compliment each person in your household at least once a week, decide to share only positive material and feel-good sentiments with your social media networks, vow to pick up trash whenever you see it on the ground, or make it a point to be kinder and patient to people in the stores and on the road. I think you get the idea. Claim your peace. Own your peace. Be peace. Living for REAL is all about using your creative and loving power to manifest moments and days that are filled with peace and ease. It is about recognizing that REAL peace is a lifestyle and a choice. It is about being aware and awake enough to see that peace does exist. 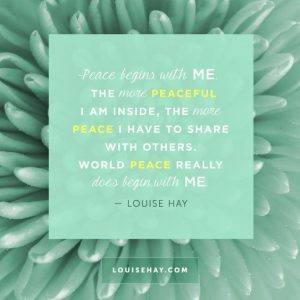 It is about understanding that inspiring and cultivating REAL peace is an inside job, and it is about accepting responsibility to do that job. 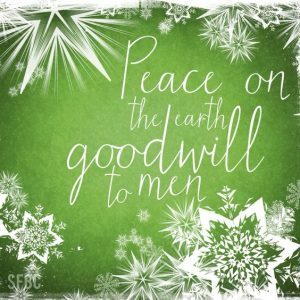 Decide today to make peace on Earth and goodwill to men your daily mantra. Claim ownership of your REAL peace and do whatever you reasonably can to share it. RIP is an expression that was never meant for the dead, it is meant for the living. And that’s the REAL tea. Get REAL inspired about creating REAL peace and goodwill in your world, and check out more REAL resources in the library!